There’s the Gingerbread House and the Griswold Inn, one of America’s oldest watering holes. And there is “the great attack” that took place at dawn on April 8, 1814. Some call it the Pearl Harbor of the War of 1812 because of the element of surprise and the aim to destroy ships of strategic value. A British raiding party snuck into town on rowboats, set up shop at the Griswold (then known as Bushnell Tavern), commandeered stores of ships’ ropes and rum, and torched 27 vessels, including several newly built privateers, which were a major nuisance to His Majesty. But there is at least one more Yankee aspect in Essex, one that neatly fits the town’s maritime heritage. Docked at the Connecticut River Museum, next to the 1906 gaff schooner Mary E, is a functional artifact that’s named Yankee, as in Irving and Electa Johnson’s Yankee. 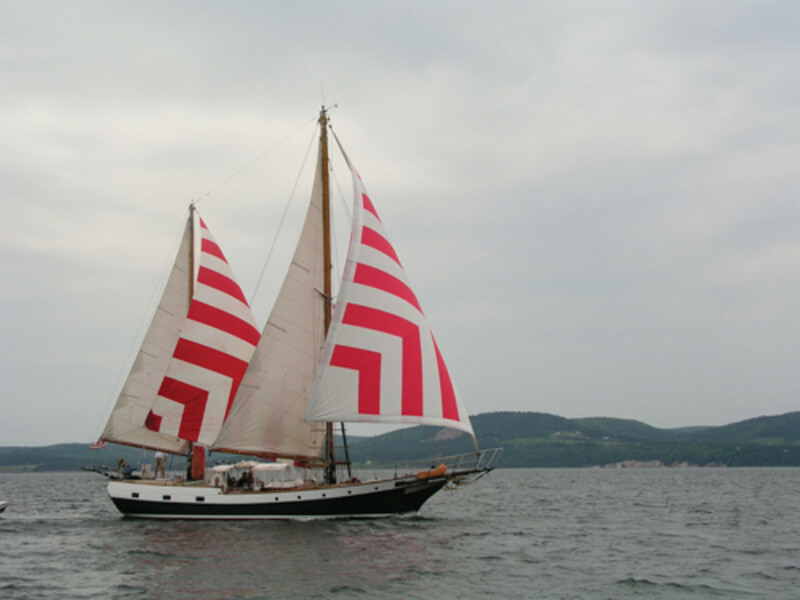 The legendary voyaging couple’s third vessel by that name, she was designed by Sparkman & Stephens and built in the Netherlands in 1959. She may not be a Yankee by birth, but she’s Yankee all the way in spirit. By today’s standards, she’s a tank of a 63-foot ketch, built of steel and displacing a hefty 70,000 pounds. 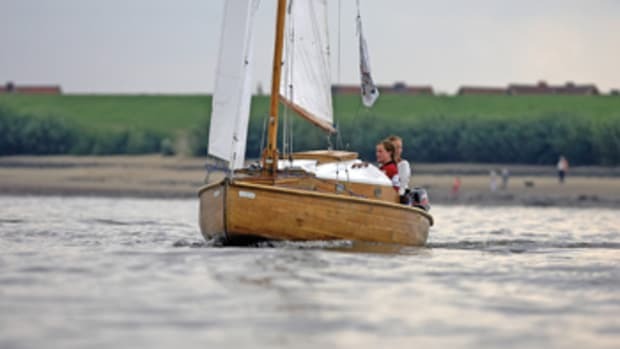 And that doesn’t include a keel because she was fitted with tandem centerboards instead. In Irving’s own words, she was meant to “climb mountains, cross oceans and survive shipwreck.” For decades, he and Electa circled the globe — seven times in all — often with guests who paid a pretty penny to sail before the mast and work as crew. Getting on in years, the Johnsons turned their attention from white-knuckle adventures to more cultured travels that required a vessel capable of handling diverse destinations with dexterity — a compromise if there ever was one, but one that still works as advertised. They puttered through the canals of Europe and made the cover of National Geographic in 1965 for their cruise up and down the Nile (before the Aswan Dam was completed). Their boat is also the hero in Yankee Sails the Nile, one of the books the Johnsons wrote about their adventures, which helped inspire generations of young sailors to follow in their footsteps. 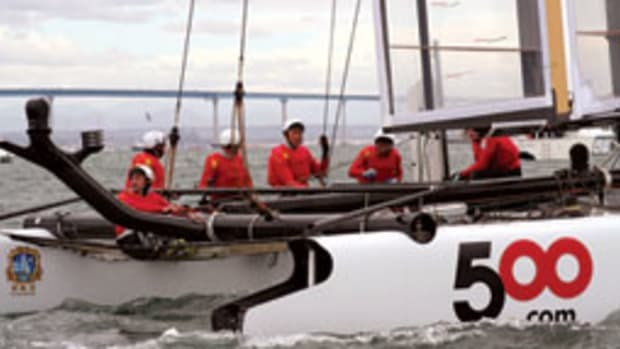 Among those sailors is the boat’s current owner, Gordon van Nes, a retired physician from New York who makes his home in Chester, Connecticut, on the river near Parkers Point. “I would have given my right [arm] to sail on Yankee when I was young,” van Nes says, adding that he never thought he’d own this yacht. “But I found her in Newport [Rhode Island], and she talked to me.” It’s a familiar story of good ships finding good owners. 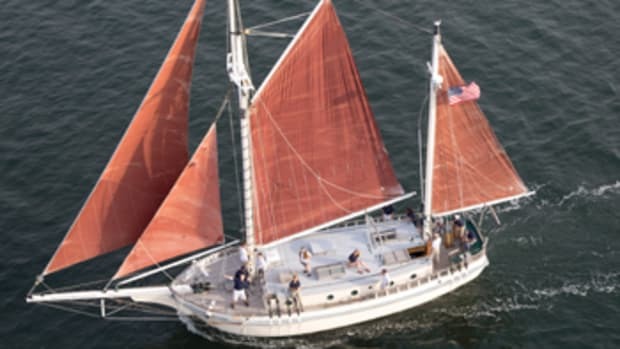 Van Nes, who has always liked boats that need fixing up, learned the ropes on the Starling Burgess-designed, 70-foot schooner Niña — a famous vessel in her own right — which his father owned for a while. 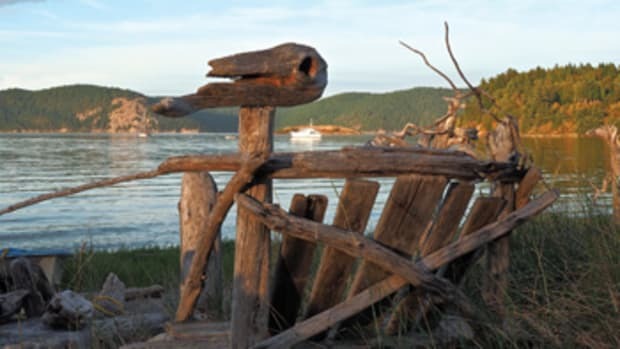 Building on this experience, he set off on his own Johnsonian adventures, after finishing medical school, aboard Pilot, a 126-foot Burgess schooner that he and some friends bought and restored. “I expected to be sent to Vietnam, but the war had ended, so I was practically given two years,” van Nes says. Under his command, Pilot cruised the Pacific in 1974, sailing as far as the Indian Ocean before returning to San Francisco, where actor and schooner man Sterling Hayden greeted them in a launch as they sailed under the Golden Gate Bridge. Borrowing a page from the Johnsons’ script, van Nes and his partners took on guests who shared the cost as stakeholders in an S corporation formed for Pilot. The voyage originally was intended as a full circumnavigation but was cut short by dengue fever, which some of the crew contracted, and the demands of the medical field, which was to be van Nes’ profession. Sailing on a schedule often brings trouble, and nobody knows this better than van Nes, who on New Year’s Eve 1966 made the front page of The New York Times. 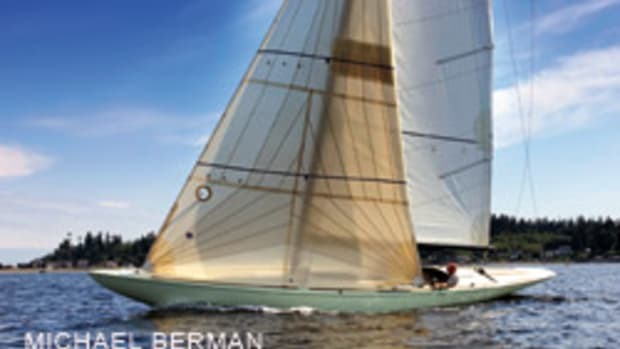 He was skippering his brother’s 70-foot Sparkman & Stephens yawl Petrel, which had conducted sailing tours out of Manhattan for many years, to Bermuda and the Caribbean. That was the plan, but delays postponed the departure until Christmas, much too late to hope for smooth sailing. A massive storm veered into their path and strained the balance in the yacht’s good-luck account. It must have been sufficiently covered, as crew and boat survived, but barely. “5 Saved, 5 Stay Aboard Battered Yawl” the headline read, accompanied by an aerial shot from the Coast Guard that showed the pretty boat wallowing in high seas. But with her variable draft — from 4 feet, 6 inches with boards up to 8 feet, 4 inches with boards down — Yankee is used to nosing up to the beach, as one of the famous National Geographic shots proves. It shows the ketch with fully drawing sails, including her trademark red-and-white-striped jib, hard aground on the sandy shores of the Nile near Abu Simbel, with one of the sailing guests dangling from Yankee’s bowsprit held only at the wrist of her right hand by skipper Irving, who was about to swing her ashore so she wouldn’t get her feet wet. When van Nes uses Yankee privately — when the boat isn’t entertaining guests on afternoon and sunset charters — he sails her to Nova Scotia, Bermuda, the Caribbean and points in between. He can sail stretches on the Intracoastal Waterway without folding her tabernacle masts, as Yankee’s air draft is only 63 feet, which allows her to fit beneath bridges. Even in the most congested areas, the Ditch is a breeze, compared to the Nile: no heavily laden feluccas guarded by nasty iron rub rails and sailing without running lights; no corrupt lock wardens waiting for a wad of baksheesh before even thinking about doing their job; no queuing up so water pipes can be disconnected and drawbridges can be opened. Yet the yacht’s riverboat skills are called upon when she charters, taking as many as 22 guests for spins on the Connecticut River. It’s a fun gig that keeps boat and skipper in shape, but it’s also demanding to comply with Coast Guard requirements for inspected vessels. Over the years, van Nes, who’s only the second owner since the Johnsons sold Yankee in 1975, has had plenty of work to do. 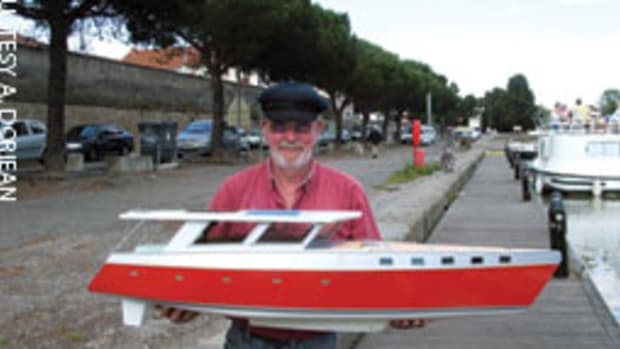 He rebuilt the main mast and the Detroit 371 auxiliary diesel, and updated the exhaust system. He serviced the rig, which still has the original roller-furling booms that Johnson used. And he cut the plates for the new steel deck he installed with the help of a professional welder. That is why Yankee still has a spring in her step, relatively speaking, for a vessel that pushes more than 30 tons through the water. But that doesn’t mean she can’t put a bone in her teeth. “We did 7.5 knots on a 30-hour reach from Florida to Nassau,” van Nes says. Sailing close to the wind in choppy seas is not her strong suit, but remember, Yankee was not designed with that task primarily in mind. Even so, van Nes says, she doesn’t take green water on deck often and doesn’t sail on her ear. That’s a plus in the comfort column when sailing with guests, as is the sociable arrangement of her accommodations, with the galley, dinette and captain’s quarters aft, and a large center cockpit with a full Bimini. Would van Nes buy the boat again if he were in a position to make this decision today? “Yes,” he answers firmly. 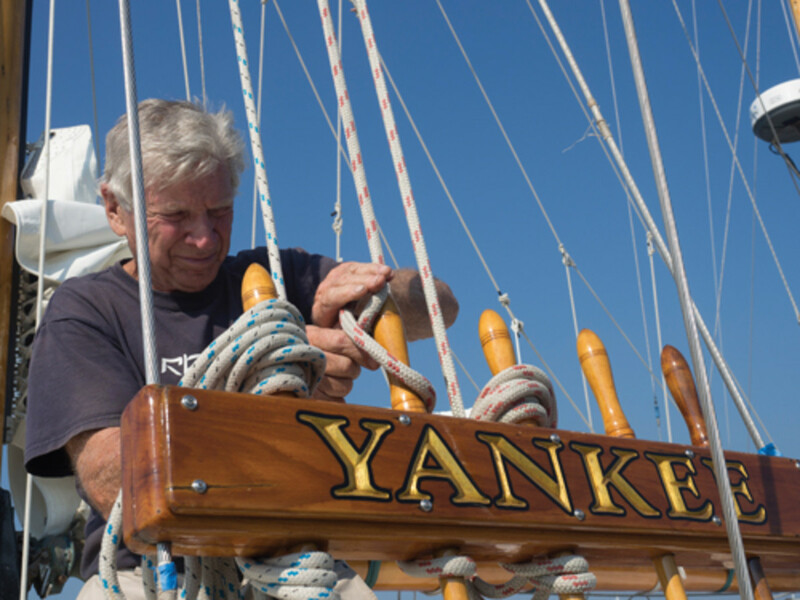 “Perhaps I say it because I’m not sure I could face the fact that maybe I shouldn’t [have bought her],” he adds without a hint of remorse but with the wisdom that comes from years of owning big boats, such as Yankee, that need a good and experienced hand. 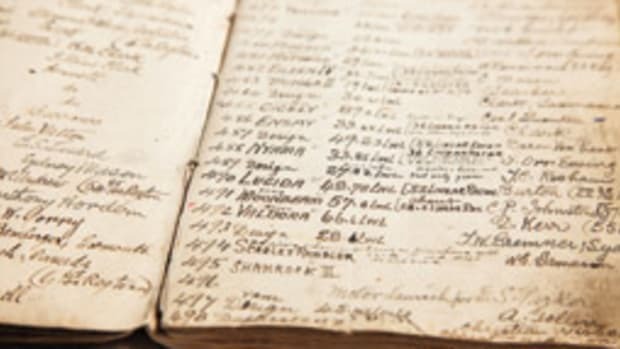 They let you know when it’s time for a new owner, someone with the wherewithal to maintain her as van Nes has for nearly two decades, someone with the same appreciation for the history and stories woven into her fabric. Next time your travels take you to Essex, go see the Gingerbread House and have a draft at the Griswold Inn. Stroll down Main Street and imagine how the 1814 raid played out. 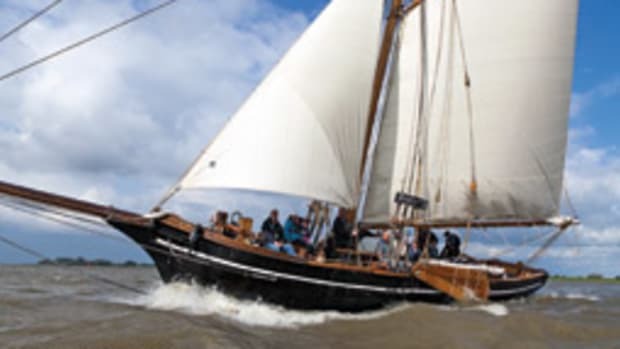 And do yourself a favor: Visit the Connecticut River Museum and Irving and Electa Johnson’s famous ketch, which is docked right there, waiting to take guests for a spin — and for a new owner who’ll take the watch from van Nes and become her next custodian (yankeesailing.net).